The Q-Bay hamburger from Q-Bay burger is an exquisite burger. Q-Bay has a usual suspect burger character about itself – the place is simple, white, small and not all that clean but actually clean. Its coloring comes from twofold, the one man army behind the burgers – whose essence gently transfers onto the burger as you almost see his belly kiss the top of the bun; and the ingredients, all stacked up and ready to go, together they bring life to this place. The burger experience begins from the instant the bacon and beef are tickled by the grill, their sizzling laughter releases a whirl that gently dances around the room carrying with it an elation towards the thought of experiencing these savours in one’s mouth – at that moment, one can only look towards the burger taste balance. Once a fore the burger’s appearance and presentation though not pretty remain simple, everything has been laid on top of each other in an organized chaos; its coarse ingredients, patty exempted, build a cumbrous construction, an unfinessity that really adds little to the burger. The beef patty, the only ingredient that one could wish to be bulkier, is graced by a great meat taste that has been further enhanced by a thick layer of pepper – its spicy peppery kick, felt through juiciness and suitable textureness, is to be welcomed. The slabs of bacon with their noticeable overwhelm aren’t too crispy, but what they lack in soft brittle they make up with full salty bacon goodness that is well positioned in the burger. The rest of the ingredients lack the flair that the bacon and beef show, but they add to the burger’s disposition. The almost unwieldy slightly too crisp faintly too dry for the burger bun is a bit of a dud; the burger’s fauna has a faint freshness and bulking cut, and while the iceberg lettuce and tomato remain calm, the overtly chunky onion can be a tad too flavorful. With a couple of lettuce options, a red leaf lettuce adds some flair to the greens. The cheese spreads in a joyful gooey yellow, and a bbq sauce manages to give the burger a good solid fresh tang. The fries are nice and crispy. 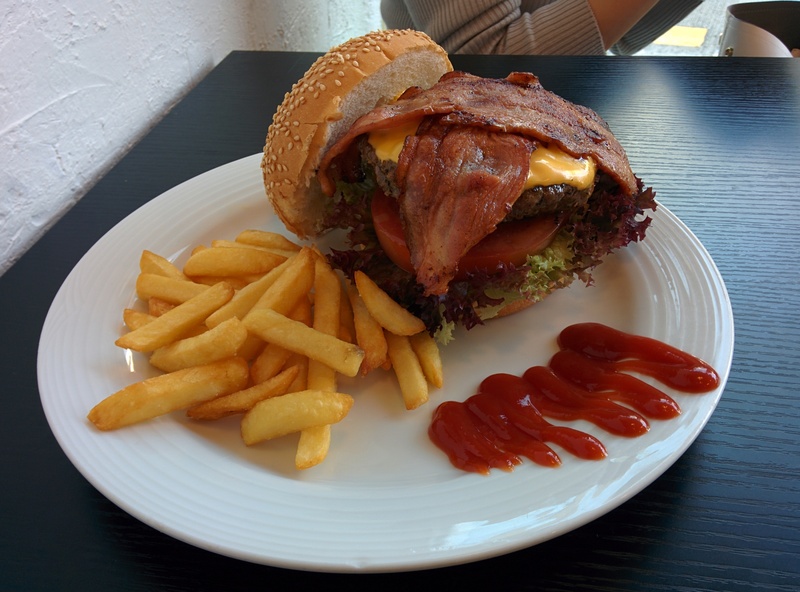 For 68.00 HKD, plus 15.00 HKD for marvelous bacon which should be added, this is a burger that is worth a try. It simply is a quick no hassle burger in a no frills but yes frills burger joint. I’ve always had a lot of burgers! Even before starting my blog! You ever visit burger places?